• Is The Courage to Be still a viable analysis of the human situation? • Does Tillich's positive sense of Eros illumine our intense discussions of human sexuality? • Does Postmodernism really dissolve Tillich's major assumptions? • Can Tillich contribute to the contemporary discussion of science and religion? • How does his work stand when compared to other writers on creation, such as Langdon Gilkey and Sallie McFague? • Given the paradoxes of Tillich's life, is his ethical theory still viable? 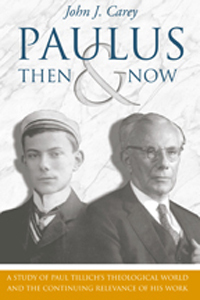 In Paulus, Then and Now: A Study of Paul Tillich's Theological World and the Continuing Relevance of his Work, John J. Carey clarifies previously neglected foundational aspects of Tillich's thought. Carey places Tillich's theological work in political, social, economic, and scholarly context. He also explains Tillich's thinking on Luther, Marx, history, and politics, and his unique perspective on the Bible and on biblical authority. Having accomplished these things, Carey then moves to show how Tillich's thinking can be applied to contemporary problems.